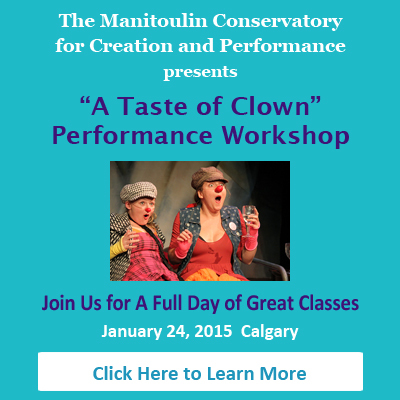 Join us for a workshop giving you a taste of clowning – led by some of the clowns from the Manitoulin Conservatory for Creation and Performance – with special guests John Turner and Karen Hines. The workshop is designed to give participants an idea of some of the things they may learn by attending the Conservatory on Manitoulin and the opportunity to play and discover for the day. Please note that the workshop is designed to be participatory for adults and we do not have any places for people to audit or just watch proceedings. All levels of performance and training background are welcome. All funds raised from this workshop will support The Manitoulin Conservatory for Creation and Performance in their programming and bursaries for future students. Thank you to all our instructors for generously sharing their time and talents!